Specifications Weight: 2 ft: 2.5 lbs (1.2 kg) 4 ft: 5.8 lbs (2.6 kg) 8 ft: 12.5 lbs (5.7 kg) Construction: One-piece polycarbonate housing with one-piece polycarbonate lens and stainless steel clips. The standard color is gray. 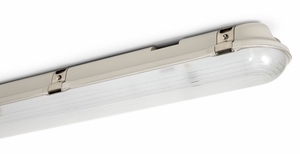 LED System: LED system with a life rating of ≥84,000 hours (HUV) L70 @25°C. Luminaire efficacy up to 140 LPW. Electrical: Offered in 20, 25, 40, 50 and 65 Watts, the luminaire is designed to operate through the 120V-277VAC universal voltage and 347-480VAC high universal voltage range. The LED driver has a 2.5kV inherent surge suppression and is a constant current device, meeting UL1310 and UL48 Class 2 with built-in over temperature protection. The power factor is ≥90% and THD is ≤20%. Dimming: The driver is 0-10V dimmable (down to 6%). Please reference the dimmer compatibility document (LEDLUM012). Color Characteristics: CRI>80; CCT of 4000K or 5000K. Optics: Type V distribution with a clear etched polycarbonate lens or optional diffuse lens (sold separately). Installation: Luminaire mounts to recessed outlet box or can be surface or chain mounted (chain not included). Connector available for tandem wiring. External controls can be added through existing knockouts. Operating Temperature: -40°F to +122°F (-40°C to +50°C); EM: +14°F to +122°F (-10°C to +50°C); 8ft: -40°F to +104°F (-40°C to +50°C). Listings: cULus listed to UL1598 standards for wet locations, IP65 or IP66 rated, and ETL Sanitation listed for NSF splash zones. Warranty: Standard 5-year luminaire warranty (LEDLUM001).